“On National Teacher Appreciation Day and during National Teacher Appreciation Week, we honor America’s outstanding teachers and the vital role they play in the lives of our children and the success of our country. Principals, most instructional staff and some non-instructional staff (such as clerical workers and counselors) will need to reapply for their jobs, said Michelle Zdrodowski, spokeswoman for the school district. Special education teachers, early childhood education teachers and noon-hour aides will not, she said. Detroit Federation of Teachers President Steve Conn called the plan misguided. “This is not good for education at all. … All you’re doing is blaming and attacking teachers,” he said. Because nothing says “We value educators”, especially during National Teacher Appreciation Week, like forcing them to reapply for their jobs, jobs done under some of the most difficult – some would say nearly impossible – conditions in the entire country. In America, every child is born with limitless promise, and each deserves a chance to achieve their dreams. A world-class education can unlock a young person’s full potential and empower them with the knowledge and skills to reach their highest aspirations. As a Nation, we must provide every girl and boy in America with such an opportunity, and this cannot happen without great teachers. On National Teacher Appreciation Day and during National Teacher Appreciation Week, we honor America’s outstanding teachers and the vital role they play in the lives of our children and the success of our country. In classrooms across America, talented and hardworking teachers are nurturing a new generation of thinkers, doers, and dreamers. They teach the subjects and skills that will fuel the next century of growth and innovation, as well as the virtues and values — like character, compassion, creativity, and resilience — that will prepare their students to take on the challenges of the future. Our best teachers are role models who show our kids how to work hard and pursue a brighter tomorrow. They encourage our children’s passions, inspire their imaginations, and help them realize the best versions of themselves. Teaching is an all-encompassing commitment, and teachers make enormous sacrifices to support their students. My Administration is dedicated to promoting excellence in teaching and ensuring all teachers have the resources, support, and tools necessary to succeed in their classrooms. We are working to strengthen the ways we prepare, develop, support, and advance America’s teachers. And as part of this effort, I have called for an all-hands-on-deck approach to prepare an additional 100,000 teachers in the important fields of science, math, engineering, and technology — a STEM Master Teacher Corps — to serve as beacons of excellence in teaching as well as leaders and mentors for their colleagues. Additionally, through the Teach to Lead initiative, the Department of Education is empowering teachers to have a voice in what happens in their schools and their profession without leaving the classroom. And we are working with States to implement best practices that will help more of our best teachers — across all disciplines — reach the communities and children who are most in need. Great teachers make a lasting impact on their students’ lives. When a young person learns from an exceptional teacher, they are more likely to graduate, attend college, and succeed later in life. Teachers lift up the next generation and enrich our Nation, and they deserve our gratitude and thanks. This week, as we remember the teachers who touched our lives and shaped our futures, let us recommit to supporting those who serve in America’s classrooms. By investing in our Nation’s teachers, we can build a world where every girl and boy can dream big, hope deeply, and realize a brighter future. 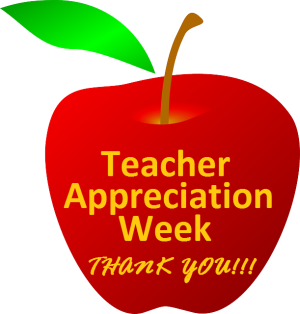 NOW, THEREFORE, I, BARACK OBAMA, President of the United States of America, by virtue of the authority vested in me by the Constitution and the laws of the United States, do hereby proclaim May 5, 2015, as National Teacher Appreciation Day and May 3 through May 9, 2015, as National Teacher Appreciation Week. I call upon students, parents, and all Americans to recognize the hard work and dedication of our Nation’s teachers and to observe this day and this week by supporting teachers through appropriate activities, events, and programs. IN WITNESS WHEREOF, I have hereunto set my hand this fourth day of May, in the year of our Lord two thousand fifteen, and of the Independence of the United States of America the two hundred and thirty-ninth.